The concept of the charity record wasn’t exactly new in the 1980s. Before that former Beatle George Harrison had released The Concert for Bangladesh in 1971, and his one-time colleague Paul McCartney had put together Rockestra, issuing an EP to benefit the Cambodians of Kampuchea. But there had never been an effort like Band Aid, which came together over a very short time in 1984 and effectively defined the idea of the charity record not once, but three times over the course of 20 years. Inspired by the images of Ethiopian famine on television, former Boomtown Rats singer Bob Geldof determined to do something to help alleviate the crisis. 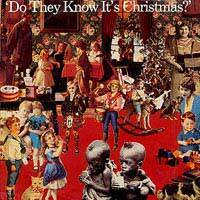 He teamed with Ultravox’s Midge Ure to create a song, Do They Know It’s Christmas? to be released as a charity record. It was an excellent idea, and after a trawl through his address book, Geldof had lined up the biggest celebrities in rock and pop to help on the recording. Everything was done on November 25, 1984, as a studio donated time, and the next morning Geldof premiered the single on Radio 1. A total of 24 musicians and singers had given their time and effort, and the aim was to have all the money go to charity (after a brief impasse about VAT, the British government agreed to waive tax on the record). The single went on sale on December 15, rocketing to the top of the charts and becoming the fastest-selling single in recorded history at that time, with a total of three million copies sold as it remained on top of the charts for five weeks over the holidays and into 1985. It raised millions and inspired not only the American charity single We Are The World, but also the massive Live Aid concert in July 1985. The five years since the original Band Aid record had done little to stem the Ethiopian famine – even millions of pounds hadn’t helped. Geldof decided it was time not only to remind people of what was going on there but also raise more money. This time he enlisted one of the most popular producers of the time, Pete Waterman, to organise things. It took Waterman all of 48 hours to line up the talent, arrange the studio and have a backing track recorded. With 17 big pop stars, from Wet Wet Wet to Cliff Richard, involved, it was a guaranteed hit, and by the time it was released on December 15, there were already advance orders of half a million copies, which made it the Christmas number one, and raised several million for charity. The 20th anniversary of the original Band Aid was the perfect occasion to put out a new version of the disc, and 34 people participated in the event (although only George Michael, Paul McCartney and Bono came back from the original crew). The song was available both on CD single (it sold 200,000 copies in a week, and once again was the Christmas number one) and download, although there was a slight altercation with iTunes over pricing. It’s become the charity record by which all others are measured, certainly the most important ever recorded, and the original remains a seasonal radio perennial. Additionally, it made a public figure of Geldof, who not only organised the records, but also the Live Aid and Live 8 concerts.